Zainel was appointed as an alternate director in May 2017. 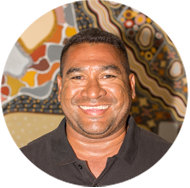 Born and raised in Kununurra, Zainel completed his secondary education in Kununurra and went on to complete further qualifications in Perth. Zainel is currently employed by Gooring Jimbila Contracting and works full time at the Argyle Diamond Mine. He has extensive commercial experience, having previously held positions with Kimberley Agriculture Investments (KAI), Leightons, Mount Gibson Iron and Rio Tinto. Zainel is committed to promoting economic empowerment and self-sufficiency for the MG community.